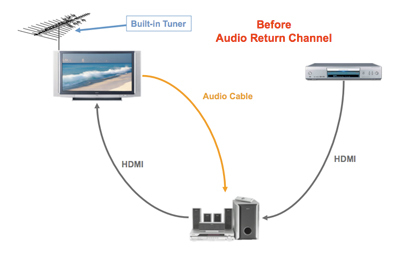 The Audio Return Channel in HDMI 1.4 enables a TV, via a single HDMI cable, to send audio data “upstream” to an A/V receiver or surround audio controller, increasing user flexibility and eliminating the need for any separate S/PDIF audio connection. TVs have always been able to receive multi-channel audio through an HDMI connection, and this is still a typical use-case, with the TV positioned “downstream” from content sources and any connected audio equipment. However, if a user had a TV with a built-in tuner or DVD player, and wanted to send content “upstream” from the TV back to the audio system, a separate connection had to be installed, typically an S/PDIF cable. Look for devices that feature Audio Return Channel functionality. Connect your devices through Audio Return Channel-enabled HDMI ports. HDMI LA has strongly recommended that Adopters label all Audio Return Channel-compliant HDMI ports with the letters "ARC" for easy identification, but does not require manufacturers to do so. Please check with your manufacturer to determine which HDMI ports (if any) will support Audio Return Channel functionality. Simplifies cabling by merging upstream audio capabilities into a single-cable HDMI link.